Argan Oil Deluxe is the luxurious fountain of youth for demanding, lipid-deficient skin. It helps retain moisture for extraordinarily supple skin. 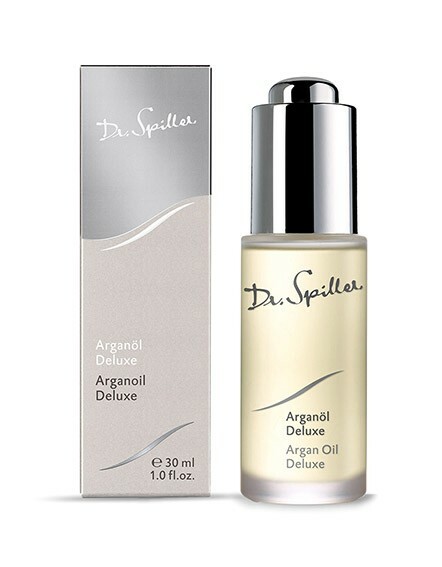 Argan Oil Deluxe is the luxurious fountain of youth for demanding, lipid-deficient skin. It helps retain moisture for extraordinarily supple skin. Argan Oil, Marula Oil and Baobab Oil are among the most precious oils in the world and make the skin uniquely soft and supple. Skin can retain moisture and the wonderful fragrance highlights the beautiful feeling of perfectly nourished skin. These precious drops of oil can be used to enhance any skin care cream. Apply appropriate active ingredient cream enriched with a few drops of Argan Oil Deluxe to face, neck and décolleté morning and/or evening after cleansing.